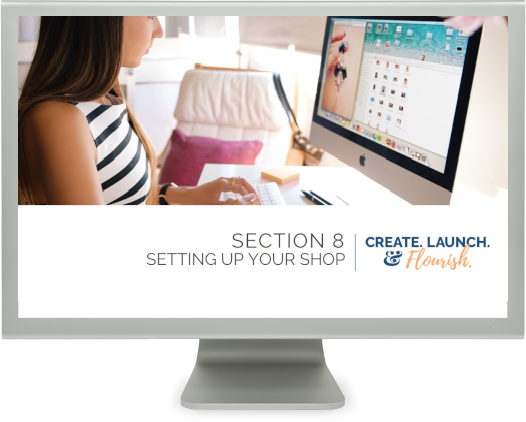 Are you ready to launch your own website with an online shop? Free yourself from Etsy fees and constant algorithm changes! You're hustling like crazy for your Etsy shop but recently your sales have dropped to a mere trickle. It feels like someone just hit the OFF switch. You’re spending your precious weekends hauling tables, products, and a tent to craft shows, but you’d rather be cozy at home or spending time with your family. You spend too much time and money tweaking & renewing your listings trying to perfect your SEO, but Etsy keeps changing the game. You feel anxious every time you peek at your Etsy bill and wonder if you're even making enough profit to keep your dream alive. You keep hearing stories about Etsy shops getting shut down for stupid reasons and you are worried because Etsy fuels the vast majority of your sales and you’d be devastated if your shop disappeared too. You’re tired of getting lost in a sea of your competitors and you want to stand out on your own away from the overly-saturated market. You put in weeks of work on a Wix site, only to realize you hate the shipping on it and you’re having issues getting it to do what you need it to do. You started playing around with Shopify’s free trial but it’s not intuitive for you at all. You don’t want to give up and keep thinking you’ll try again. You even extended your trial, but you can’t get it to work. You’ve gotten stuck trying to figure out how to configure your shopping cart and shipping settings on your own, with no help. It seemed like every feature you really wanted was an extra app ($$) on top of your monthly payment. You wish someone would just take you by the hand and guide you through each step in order, and answer your questions along the way so that you can create and manage your own shop. Imagine what it will be like to launch the website of your dreams. Send customers to your own URL, where visitors aren’t 2 clicks away from your competitor’s shop and they can experience a fully-branded shopping experience. You can spend your weekends at home with your family instead of hauling tables and tents from event to event. Enjoy higher profit margins because there are 0 transaction fees. Add as many products as you want since there are NO listing or renewal fees. Enjoy the security knowing that you own your own platform and the satisfaction of making your own rules. People will ask who you hired to design your amazing site and you'll say. "Actually, I did it myself." You want to launch your own thriving ecommerce website, but you’ve got some questions! I know, there can be a lot of questions and confusion if you're creating a website for the first time. The truth is you can build a website that costs less than $30/month. It can be drag-and-drop easy. It can have unlimited variations and a variety of shipping calculations. If you don’t have a plan to follow, it can be easy to make some critical mistakes, choose the wrong platform, get off track, and never actually launch your site. That’s why I’ve created my step by step course: Create. Launch. & Flourish! An 8 week DIY Website roadmap for handmade business owners who want to craft a thriving online shop. "I had been stuck for months, literally, like maybe even a year on publishing my website. You got me thinking on a clear path and helped me finally make decisions and I even pressed 'publish'. You have such a real and easy way about your teaching style." You’re tired of playing Etsy’s marketing games with Etsy Pro, pay to play mentality, and constantly encouraging you to discount your products or shipping prices. You feel like Etsy is turning into a big box store instead of a truly handcrafted artisan market. You’re frustrated your sales have dropped tremendously when you haven’t changed a thing. You can drag-and-drop design your site just how you want it and update it yourself without calling on an expensive developer. Adding categories and sub-categories is a breeze and your site is organized and easy for your shoppers to navigate. Prep and Setup your website the RIGHT way with step-by-step instructions. Get started on the right foot with a website that has speed, security, and backups. Navigate your dashboard like a pro and get to understand the WordPress lingo so you know how to quickly find what you want. Lock down your site with security best practices and keep your site running smoothly. Set up all your pages. Create your navigation menu in a snap. Lay out all your content, text, and images within your pages. 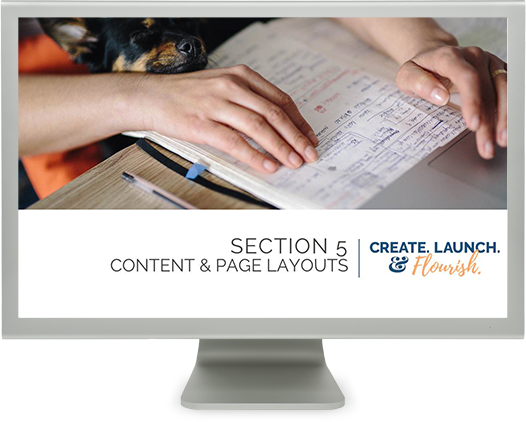 Learn to create beautiful page layouts using my favorite page builder tool. Celebrate! Your website is ready for initial launch. Take advantage of my pre-launch checklist and ensure your site is ready to go public. Learn the important ongoing maintenance tasks to keep your site running smoothly. Watch easy to follow On-screen walkthroughs for setting up your online shopping cart and checkout. Not sure what to include on your home page or about me page? No worries! 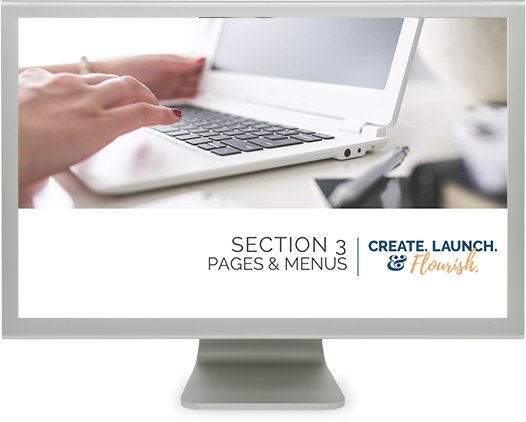 I'll explain the most essential pages you need to launch your site and what to include on them. You’ll be supported by your friendly maker community inside a private student-only Facebook group. Utilize this group to share feedback and ask questions. I know you're busy. Even if you're running your business solo, you can do this. 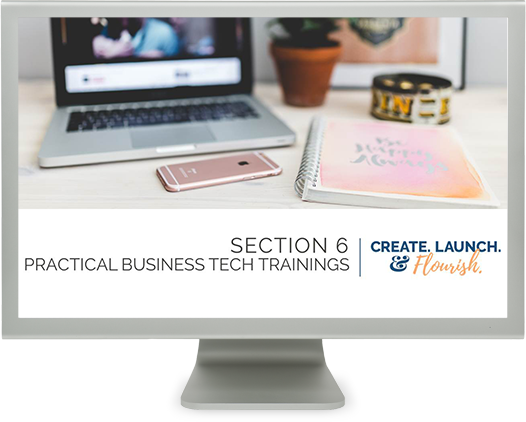 The course is comprised of bite-sized lessons so you can find what you need and implement. Pay in Full + Save $77! You can complete the course lessons from the comfort of your couch or kitchen table, as long as you have an Internet connection! Yes even on your mobile or tablet! The entire program is completely digital. All of the videos, PDF downloads, and lessons are available 24/7 through our private course portal. And you'll never miss a thing: you can go at your own pace and do the lessons on your schedule. The honest answer is, it depends on you, your current situation, and the complexity of the website you want to build. The course is designed to be completed in 8 weeks (1 section each week). I recommend you set aside 3-7 hours per week to go through the program and implement the assignments. You may decide you want to take a few extra months to create and design your perfect website. It’s up to you; there’s no rush! The great thing about this course is no matter how busy you are, you can do the work in bite-sized chunks that fit your schedule. Remember, you have lifetime access to the program and all future updates! Why is wordpress the best platform for handmade sellers? WordPress is the most popular and fastest growing1 website builder on the web because it is so flexible. You have unlimited possibilities and no limitations to what you can build. You can start small and simple, with an affordable site and then add on features and premium plugins as you grow. You don't need to spend $30 per month. I'll show you how to get started for as little as $6 per month. And rest assured, you do not need to know code to use it and make a killer site! I'll show you how to use my favorite drag-and-drop builder so you'll be able to easily create a completely customized site. 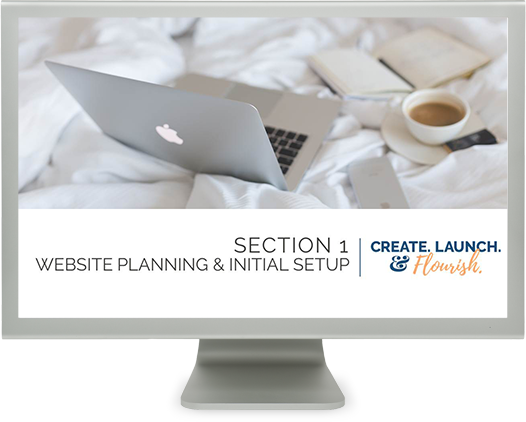 There has never been a better time to create and launch your own site. How long have you been dreaming of your own website? How long have you been putting it off instead? If you wait, you’ll be in the same place you are now. Next year, you’ll wish you had started today! 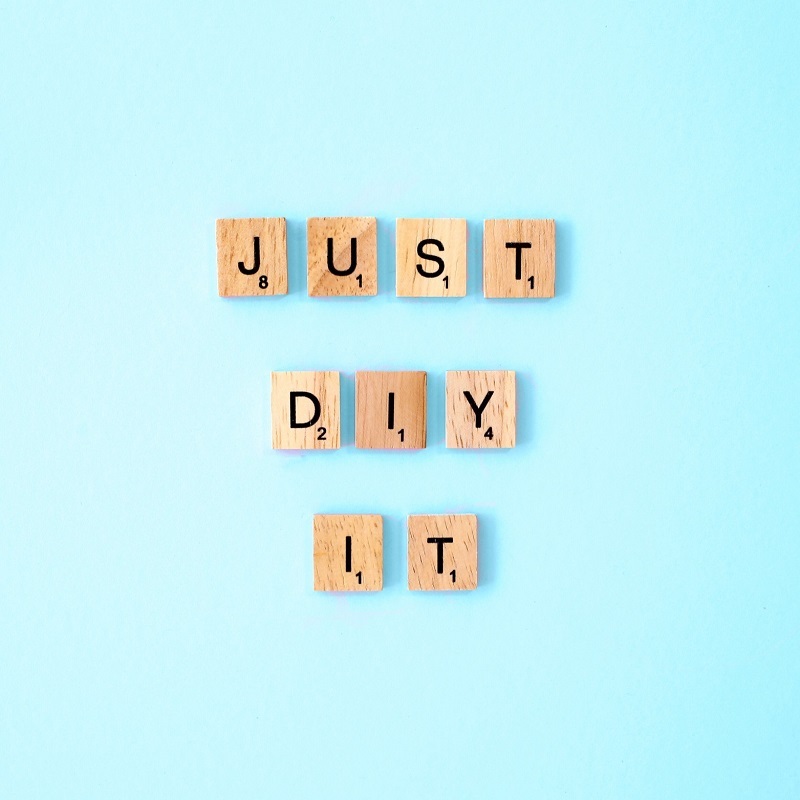 Don’t wait until your next craft show flop or Etsy emergency! Even if you’re not quite ready to start now,this course will lay the groundwork today so you’ll be ready to take big steps in the future. You’re a handmade or small business owner & want a standalone website with online shop or even just a basic website. You want to grow your business so it could become (or already is) your full-time income. You want to learn WordPress. You know there’s a little learning curve but having the ability to grow and customize later is worth it. Your time is precious - you don’t want to waste it researching and building a website by trial and error. You want me to show you exactly how to build your site, start to finish. A $3,000++ website just isn’t in the budget. You’re making sales and you want to invest in your biz, but you’re not quite ready for a custom-developed site yet. You’ve already done most of the groundwork like: ideal client, branding, creating a great product line that sells, and have good photography. You want to be a blogger and to build a blog only, with income from ads. You want to build a drop-shipping ecommerce empire and develop a site with thousands of products imported from independent vendors. Your handmade endeavour is just a hobby or a side hustle and you’re not serious about growth or profit. Cost is the #1 factor in every decision. You just want a free or very cheap website. Features, Scalability, and Quality aren’t very important. You need 24/7 phone support. If you really struggle with computer stuff and need to get 1-on-1 support often, you should consider building on Shopify. You have ZERO time to dedicate to building your site. If you don’t want to prioritize time to build your site, you should probably hire a professional web designer. You don’t have a logo, branding, or ideal customer. Your product line isn't streamlined for scaling or you're unsure if your products will sell. Building a website may seem like mission impossible, but with the right guidance it can be a smooth & fun process! You can keep trying to figure all the website stuff out on your own and hodge-podge together a site that *might* pay off in a few years. You can simply follow my step-by-step system, create your own ecommerce site that works, and let your handmade business flourish! Create. Launch. & Flourish is going to be a game-changer. "I’m just getting started and feeling overwhelmed!" Don’t worry. I will walk you through the entire process one step at a time. You can get started even if you don’t have a domain. And if you’re not ready to tackle the shop aspect, I can show you a simple trick so you can still direct traffic to your own website. $30/m is steep when you're not even sure you'll make sales right away to justify -- not to mention all the extra apps (more $$). WordPress is different. Get started for $74 for your entire 1st year. Plus, there are thousands of free themes and add-ons to get you started. "I don’t have a lot of time"
That’s OK. Without the pressure of expiring trials and recurring monthly expenses, you can take your time if need be. The lessons in the course are broken down into bite-sized videos and tutorials so you can get in, get what you need, and implement immediately during your pockets of time. Hiring a professional web designer to design and build your website and set up your ecommerce shop would be an investment of $3,000 - $5,000+. Attending an in-person 2-day WordPress Training event would cost about $800 if you account for travel expenses, meals, and a hotel for the night! This doesn't include hosting or the tools you may want to actually build your site. 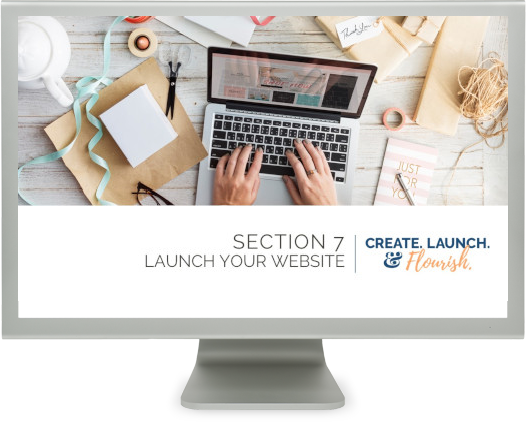 By completing this online course, you’ll build your own website and shop for under $600. Total. Including your hosting for the entire year, easy drag-and-drop builder I use on every client project, a premium theme, plus the support you get from the group! I wholeheartedly believe in the Create. Launch. & Flourish course, and have many satisfied students. But I want you to feel confident in trying it out for yourself! That's why I have a 100% Risk Free Guarantee. You can try Create. Launch. & Flourish for 3 weeks, and if you aren't satisfied, request a refund. If you do the work, put in your best effort, and feel that the course hasn’t delivered, I will issue a 100% refund. 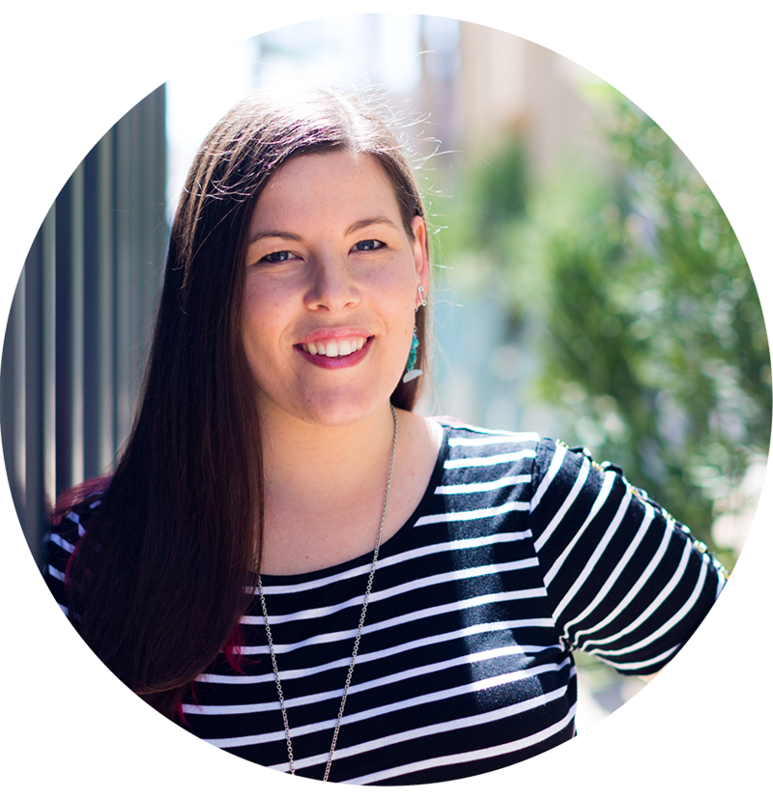 My name is Rebecca and I help handmade business owners and Etsy sellers like you DIY their own website so they can reduce their Etsy bills and enjoy better profit margins. I’ve been a professional web designer since I got my graphic design degree. I used to help all kinds of businesses - until a few years ago. I started making soap and joined a bunch of groups for handmade sellers. That was when I found my people. NOW I AM DEDICATED TO HELPING ARTISTS, DESIGNERS, AND MAKERS GRADUATE FROM ETSY TO THEIR VERY OWN WEBSITE! 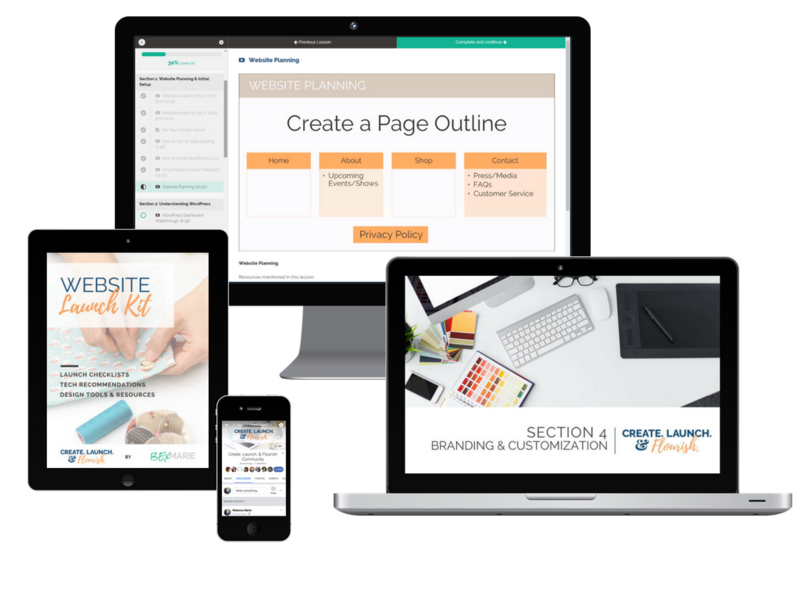 I can’t wait to help you create your website too! The course starts once you purchase and never ends! After you enroll, you will have instant access to the entire course - every section. 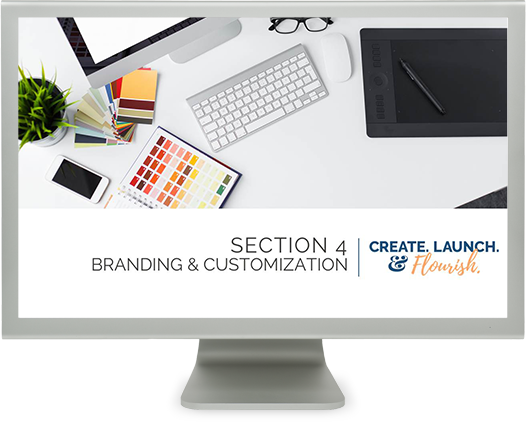 Create Launch & Flourish is a self-paced online course and you have lifetime access. You decide when you start and when you finish. If I do ever decide to retire the course, I will provide downloadable files for every student to download and save on their own computer or other devices. Do I get 1-on-1 access to the instructor while I work through the course? This is a self-paced and self-directed online course. This is not a 1-on-1 coaching program and doesn't include direct access to me. You do, however, have access to the student-only Facebook group where I check in regularly and offer support for the group as a whole. What other investments will I need to make to build my website? At a minimum, you will need to register your domain and sign up for web hosting. This investment will vary, but my recommendation for most students costs less than $100 for the year. There are many free themes available for WordPress. In section 4, I will go over 2 themes I recommend. One is free, the other is premium. Either way, you'll have a fantastic website. I also recommend investing in a premium drag-and-drop page builder tool. We'll talk about this in Section 5! There is a very basic free version of this builder available, or you can upgrade to the pro version for $99. You will need a computer (or tablet / device) with reliable internet access and sound to take this course. It doesn't matter if you use a PC or a Mac. I personally use a PC, so there may be some slight differences if you use a Mac. You should have a working knowledge of computers, the internet, and Facebook. You don't need to be a tech geek, but building a website is not going to be fun for tech-averse people. How is this course formatted and delivered? This course consists of 8 Sections with multiple lessons per section. Lessons are a mix of text and video with additional downloadable resources. Videos include screencast walkthroughs, tech trainings, and some slide presentations. All course material will be located within the private course website. You will have your own account and your progress will be saved so you can always come back and pick up where you left off. Do I need to know or learn coding? Nope! 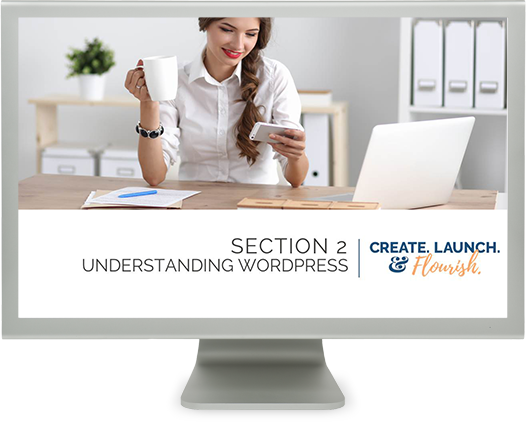 This course is designed for beginners with NO web design, coding, or WordPress experience. You will not need to learn code in order to design a gorgeous website, because I will teach you how to use a great drag-and-drop page builder. I would never want you to be unsatisfied! If you are unsatisfied with your decision to enroll, contact me in the first 3 weeks and I will give you a full refund. When you click Enroll, you'll be taken to the checkout page. Enter your name and payment info! You'll get instant access to the Welcome Section & Section 1 Lessons inside the course portal. A welcome email will explain how to request access to join the private student community! Let me help you get up and running!